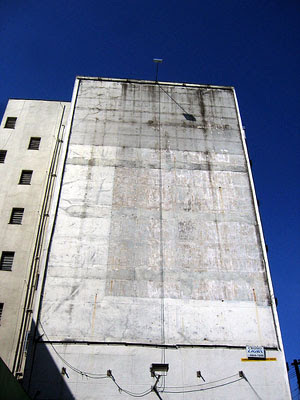 São Paulo was, until January, a city of 11 million people and 13 thousand outdoor billboards. Now, after a law banning such advertising went into effect, it's a city of 11 million (happier) people and zero billboards. The International Herald Tribune carried an article that quotes some truly vapid ad exec objections. But what would we expect them to say? Tony de Marco has documented the naked buildings and skeletal frames in an excellent Flickr photo set... one that has put him on the cover of Creative Review. I am amazed that a law like this could get passed against the usual capitalist objections centred around the freedom of rich corporations to dominate the landscape in which we live. Yet there was only one nay vote out of 46. Bravo São Paulo!